Modest clothing is something that is really important to me for a number of reasons. This choice and viewpoint with out a doubt comes from my religious lifestyle, but I am also very conscious of wanting to maintain my personality and personal style through fashion and the things I wear, as well as being modest in my look. Dressing modestly to me means that I wear my skirts, shorts and dresses to my knee (or longer), my tops have sleeves and are cut in a way so as not to show off my cleavage, shoulders, stomach (not that you’d want to see that), or too much back! Whilst to some it may seem a little out dated, we probably all wear modest fashion day to day without even consciously realising it. For me however it is a conscious choice, and one that makes me both happy and helps me maintain a sense of peace and confidence in my life. 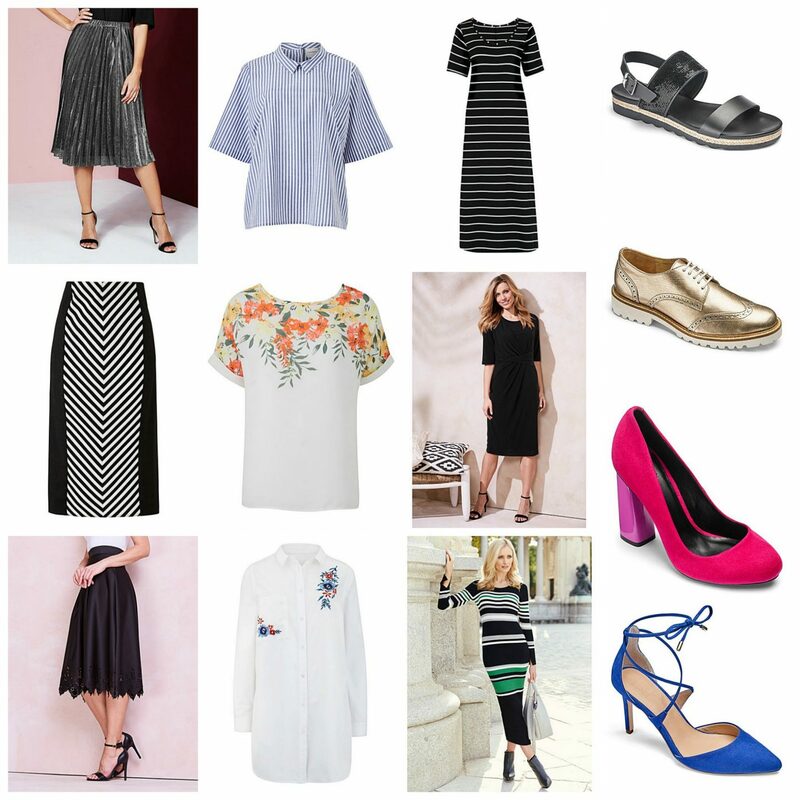 Both myself and my friends are always on the hunt for clothing that fits the bill, and as a result I recently discovered JD Williams , who whilst on the surface seem to be more aimed at middle aged women, their ranges have many a hidden gem to maintain style and modesty together. I ordered from them a skirt, a blouse and shoes that I felt would be great for a Spring/Summer look for church, weddings and special occasions. As Sundays is the only day I am guaranteed to look good with my hair done and something a little fancy/dressy on, I like to have clothes that feel a little more glam/cool than the average school run/park/town days. It’s Sunday and we always go to church, and I believe in wearing my Sunday best! 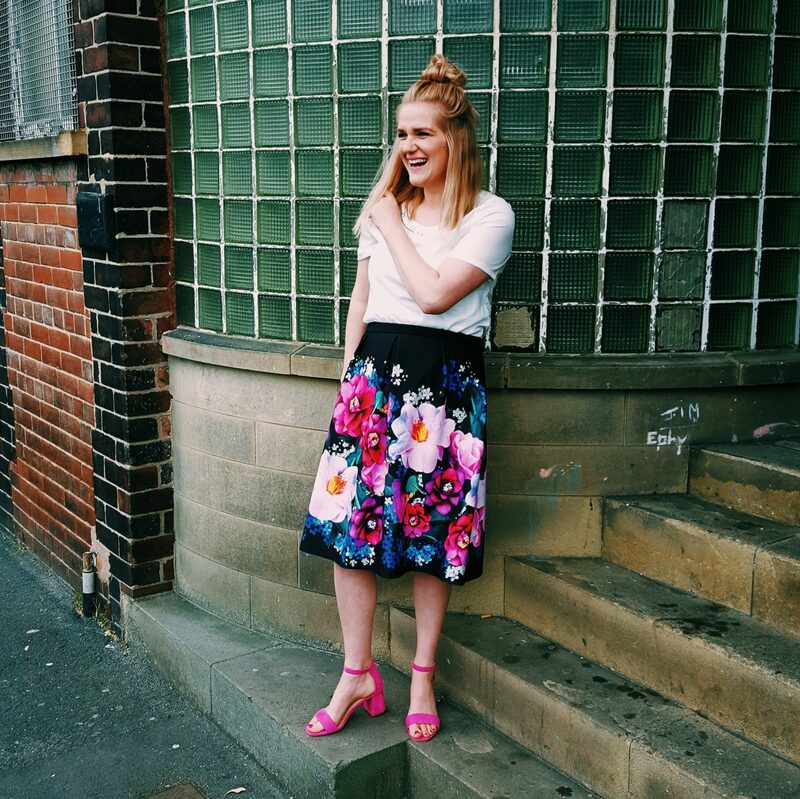 The skirt is from Grazia and is currently on sale for £34! It is made from scuba which is something I was never keen on, but I couldn’t love it more! 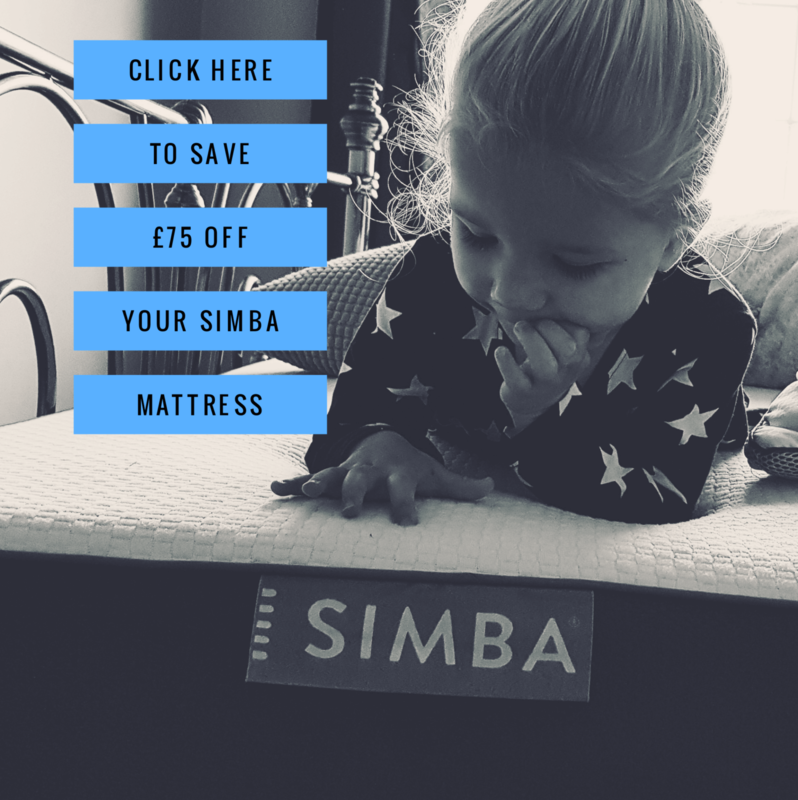 It’s thickness helps it puff out a little and is super comfy to wear and move in (especially when chasing kiddies!). I love that the bold print is very reflective of me, and the rich colours are right up my street. I am not usually a floral person, but there is something about the bright colours on the black that give it a funky feel. And best of all it is below my knee and sits well on my waist ticking my modesty box! 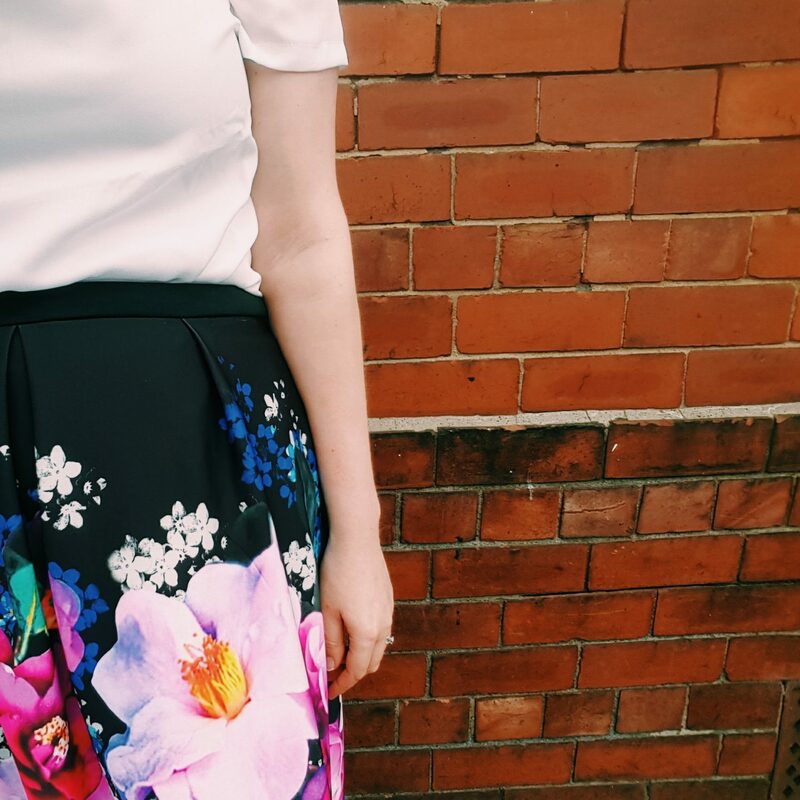 This skirt is definitely an investment – a) because its modest, and b) because it can be worn with heels and sandals in the Spring/Summer, or paired with a polo neck and Opaque tights and ankle boots/black heels in the Autumn/Winter. Next up is my Blouse. I love a good light neutral blouse for the summer and this one is lovely. The gold chain trim around the neckline keeps it modern and very me, whilst the cut is modest and cool for warmer weather. 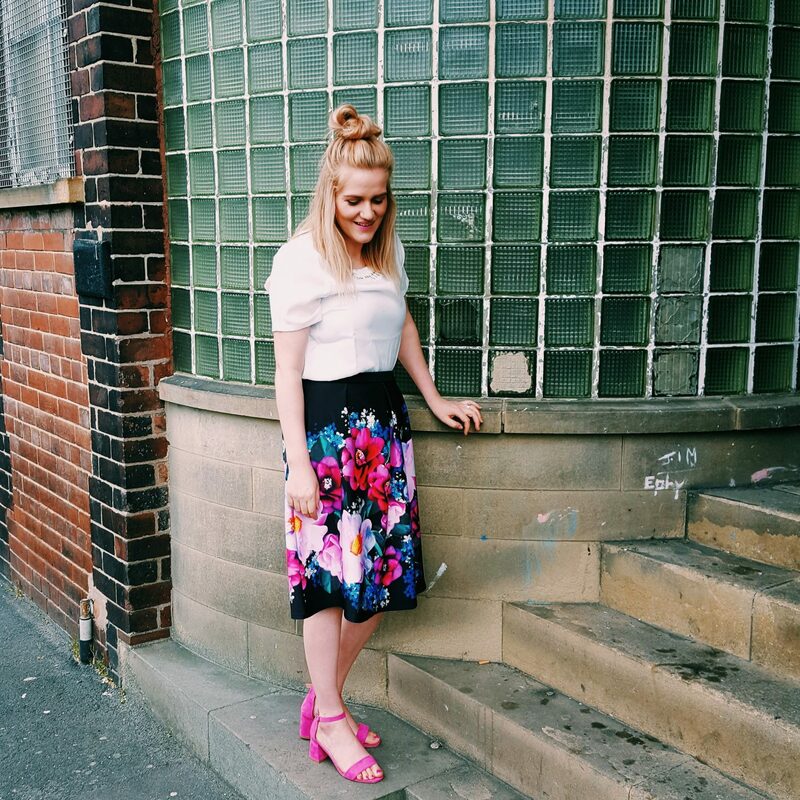 It goes great with the skirt, and I know it will also look good with any number of my other skirts, skinny jeans and trousers in my wardrobe… it is one of those versatile go to tops for any occasion. Finally my shoes. 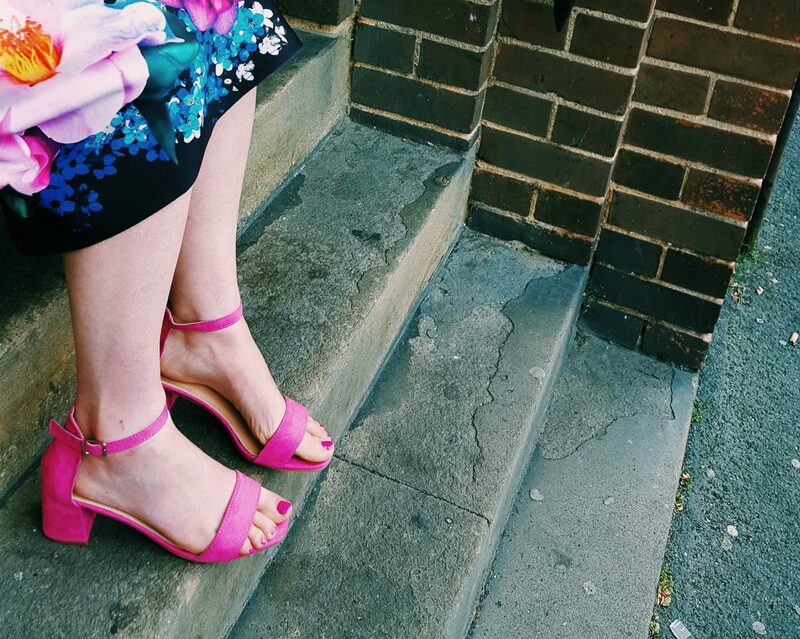 Who doesn’t need a pair of suede fuschia heels in their wardrobe? These are so me, and will update a lot of outfits I wear for church; either bringing out the pink in them, brightening a darker number, or as a statement with a contrasting colour! The chunky low heel is really comfy and easy to walk in all day. They were only £25 which I thought was pretty good for a pair or lovely shoes. 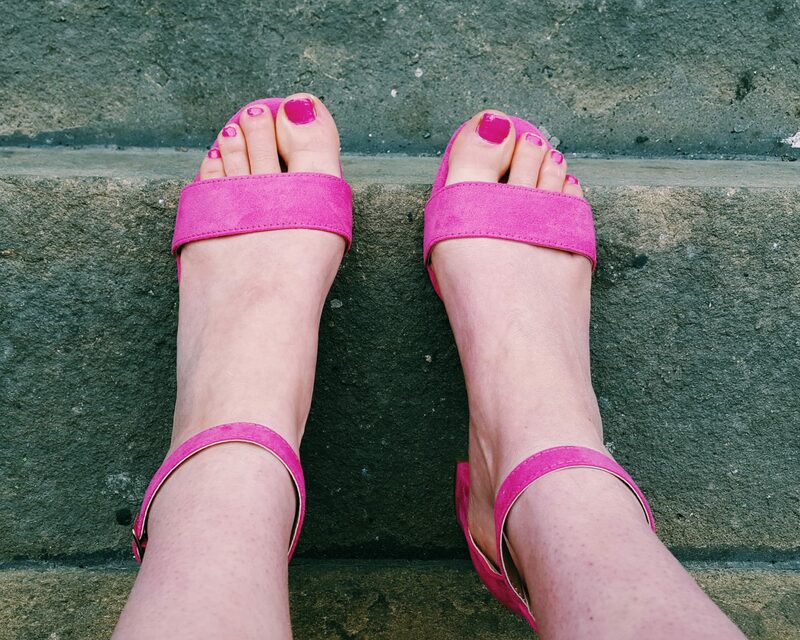 I rarely by shoes online but these are great…I have skinny ankles and whilst they are little loose around them, they are still comfy and great. 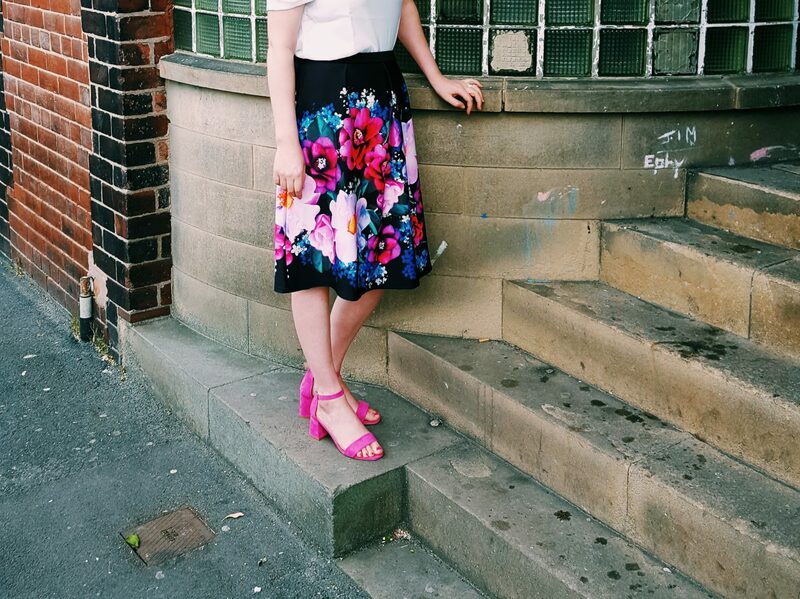 I had lots of compliments on my outfit this last Sunday and it definitely made me feel a bit glam and bright! 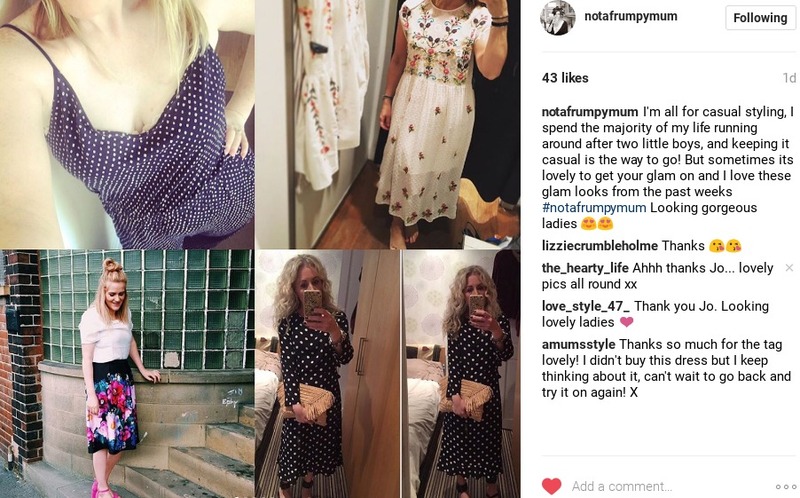 I was also featured on the #notafrumpymum round up on Instagram. Not bad! My outfit is really flexible, comfortable, glam, feminine, cool, and perfect for church, weddings, christenings and any other special occasion this summer. 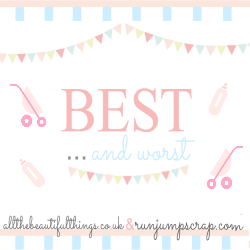 It helps be a cool mum as well as being modest and lovely…Who’d have thought this website had so many lovely things for us younger peeps? I seriously believe that modest style doesn’t have to be boring or drab, and I always ensure it isn’t. *Collaborative post. I was sent the items pictured in return for the review. 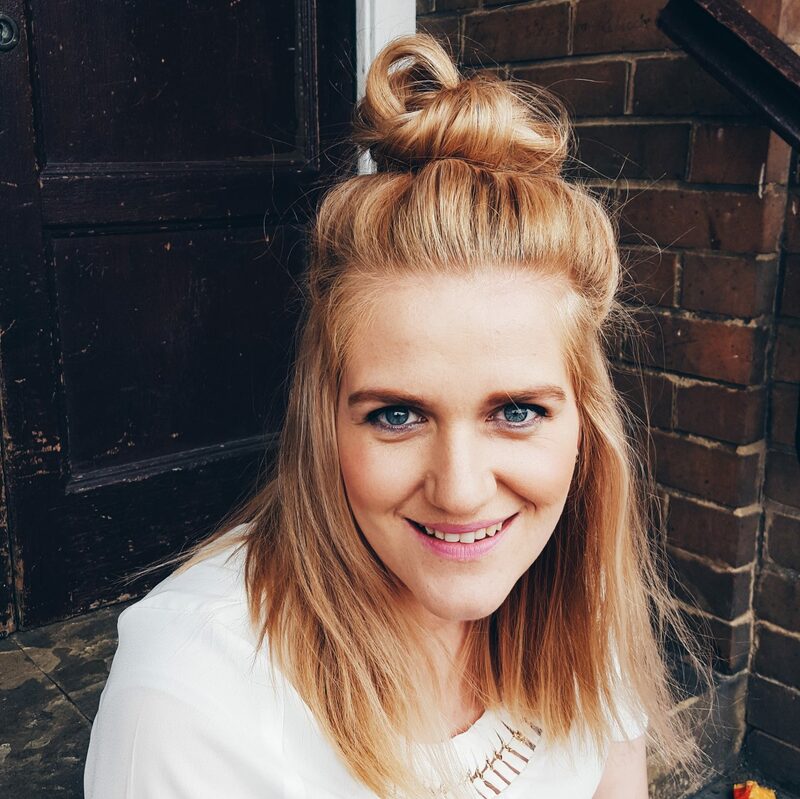 Next Post Frugal Friday #15 – Charity Shop Haul, Spring Onions & Evenings at the Park! Hello Mary, you are looking so fabulous. I love to wear short dresses and floral print mostly. You have really awesome collection . I like it very much. Thanks for sharing such a nice blog. This is a fact that fashion changes with weather; you have to choose the dressing rendering to the present season. And for that purpose you might find this article helpful, but I would say you should instead visit modest clothing stores. Because, they all the time have the clothing according to the present season.